Gale felt so good as she came bouncing in the door from school. She kicked off her shoes and headed for the refrigerator to get a glass of fresh lemonade. "Wow! YOU'RE surely in a good mood. How did it go today?" Mom asked. "School wasn't so easy today. We had a really tough math test," Gale replied. "Then what's left you in such a bouncy mood, Gale?" "Well, there's a new girl riding the bus. I noticed she was sitting all alone so I sat down beside her." "You know," mother said, "that was really nice of you to do that." "Yeah," Gale continued. "She looked so sad and alone, but when I sat down beside her, a great big smile came across her face. It made me feel so good. That seemed like such a small thing to do, but I know how I would feel if I were the new girl. I wouldn't want to be sitting there all alone." The next day, Haman went to see the King to ask permission to hang Mordecai, not knowing that Mordecai had once saved the King's life. Hearing some whispering in the outer court, the King asked, "Who's there?" "Haman is here," replied the servants. "Let him come in," said King Xerxes. When the King saw Haman, he immediately asked, "Haman, what should be done to the man I want to honor?" 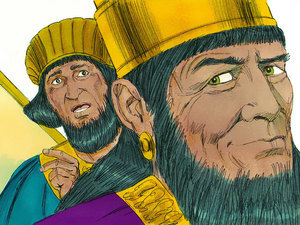 Haman smiled, thinking, "Why, of course, the only man King Xerxes could be talking about is ME!" So he answered, "Send the King's robe, the KING'S horse, and the King's crown, to one of the King's MOST noble princes, and let them dress the man in your robes, put your crown upon his head, and lead him throughout the city on your horse, SHOUTING to all the people, 'SEE HOW THIS MAN IS HONORED BY THE KING!'" Then King Xerxes smiled with much pleasure. "GOOD! I KNEW you could help me, Haman! HURRY now! Take these robes of mine and get my personal horse. Also take my crown and DO as you have said to Mordecai the Jew that sits at my gate. Do not fail to do ONE thing of all that you have said!" 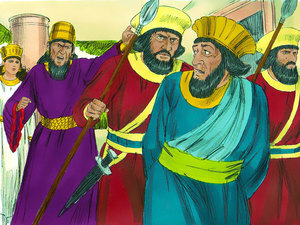 It wasn't easy, but Haman did his best not to show how shocked and ANGRY he was. The very man he wanted to hang was going to be HONORED by the King — with all these things he HIMSELF had suggested! How ABSURD! 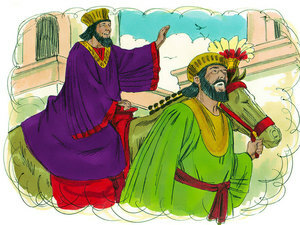 Of course, Haman could do NOTHING about it for King Xerxes had COMMANDED him. Since he had no other choice, Haman did as he had been told. He relunctantly dressed Mordecai up in the King's robe and crown, and led him through the city on the King's personal horse shouting, "THIS MAN IS BEING HONORED GREATLY BY THE KING!" Afterwards, Mordecai returned to his post at the gates, and Haman hurried home in despair. He poured out the story of how the King honored Mordecai over him at his VERY suggestion, and he cried bitterly. His wife and his friends could do nothing to comfort him. While they were still talking, a few of the King's messengers came to the door. 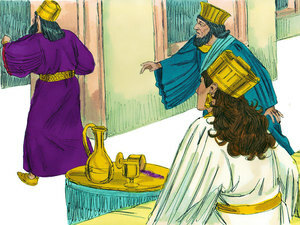 "We are come to bring Haman at once to the banquet Queen Esther has prepared." Haman hastily straightened his hair and dared not let on the way he was truly feeling. 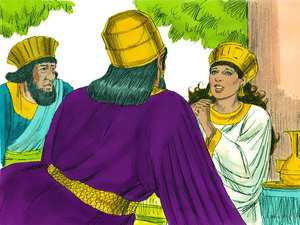 Haman met the King at the palace, and, together, they headed for the second banquet with Esther the Queen. "What is it that you want, my Queen? What is your request? Whatever it is, I will give it to you, even if you desire HALF my kingdom," the King repeated when everyone had settled. "If the King is pleased with me, I request that the King will save my life and the life of all Jews. We face death soon. I and all my people are to be killed; every one of us must DIE." 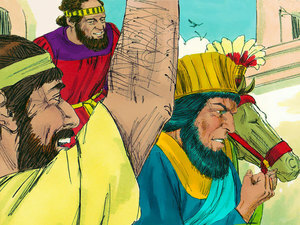 King Xerxes became VERY angry. "Who would DARE touch you or any of your relatives?" 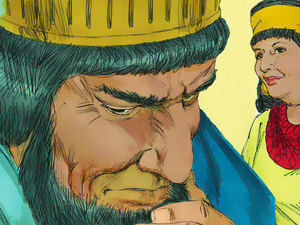 Esther looked directly at Haman and pointed. "This wicked HAMAN is our enemy." 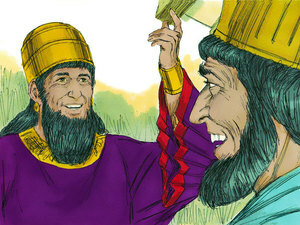 Haman was so eaten up with envy, he tried to destroy an entire people just to get to one man — Mordecai the Jew! Now Haman turned white as a ghost with fright. The King got up from his seat and STORMED out of the room into the palace garden. As soon as the King went out the door, Haman quickly left his seat and went over to Queen Esther, begging for his life desperately. He knew the King was ready to have him slain for the evil he had planned to carry out on the Jews. By the time the King returned, Haman had thrown himself upon the Queen, begging for mercy. 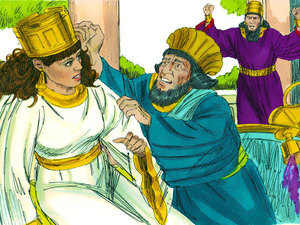 Seeing this, the King yelled and servants came running to hold Haman back from the Queen. "Why not hang him on the gallows he built for Mordecai?" someone suggested. The King sat back at the table and nodded. "YES!" he spoke with authority. "HANG HIM THERE!" And that is the way Haman died, for, in the end, Haman's jealousy cost him his LIFE. He was hung on the gallows he had built for MORDECAI. Peace was restored to the kingdom. Esther and her people were safe because Esther was willing to go before the King, EVEN if it cost her her LIFE. What do you think might have happened to Haman if he had not obeyed the King and taken Modecai through the city streets, honoring him? When Haman returned to his home sulking, what advice should his friends have given him? Who not only risked his life for us, but gave it up completely so that we might live? It is always best treat others the way you would want them to treat you. want them to treat me.